Sample tweet: "Really, Google News? You index a splog called celebrities With Diseases?" 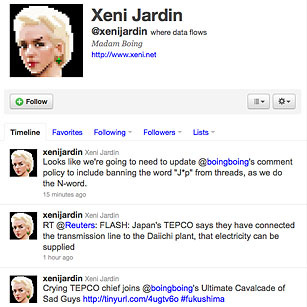 Xeni Jardin, the co-editor of the tech/culture blog Boing Boing, is a knowledgeable tech reporter with a sharp tongue and has become something of a controversial addition to the Twitter world. Her followers will see more than one "Never trust the government" quip scroll across their screens. A contributor to Wired magazine, NPR and CNN (just to name a few outlets), Jardin is one of the tech industry's biggest critics  and one of Twitter's more honest voices.